The study was elaborated within the framework of the project Legal accessibility – Second milestone implemented by Central European Service for Cross-Border Initiatives (CESCI) with the support of the Hungarian Ministry of Justice. 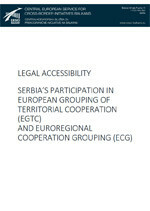 As a subcontractor of the aforementioned project, CESCI Balkans was requested to analyze the opportunities of the adoption of a legislative document enabling local stakeholders to take part in European Groupings of Territorial Cooperation (EGTCs) and / or Euroregional Cooperation Groupings (ECGs) – based on the legal background provided by the Council of Europe and the European Union. According to the above request, CESCI Balkans performed a research on the existing cross-border structures in the Balkans, especially in Serbia; on the legal background of cross-border cooperation; and drafted a set of recommendations. 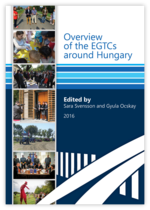 Our partner office, CESCI, has published the most comprehensive analysis so far on the functioning of the EGTCs involving Hungarian members. The volume edited by Sara Svensson (CEU) and Gyula Ocskay (CESCI) treats the legal, economic and social conditions of the functioning of the EGTCs, gives an overview on the history of the governmental policies supporting the groupings and within an evaluating chapter it summarizes the results the groupings have achived so far. Authors of the volume: Roland HESZ, Norbert JANKAI, Mátyás JASCHITZ, Gyula OCSKAY and Sara SVENSSON. The maps have been plotted by Éva GANGL, the figures are drawn by Kitti DUBNICZKI who was also in charge of the design and editing of the volume. The book has published with the financial support of the Hungarian Prime MInister’s Office in 300 examples.